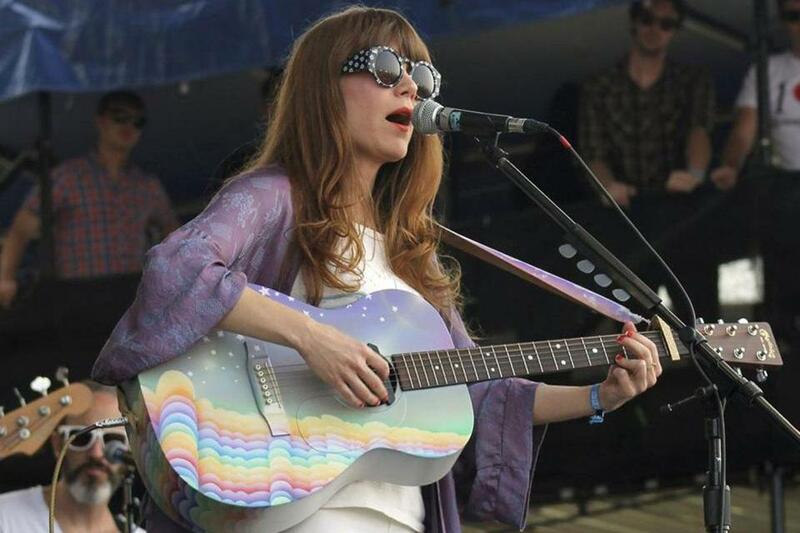 Jenny Lewis was one of the performers in Newport over the weekend. NEWPORT, R.I. – Jack White had some parting words of wisdom. He could have been reflecting on his own work, a 15-year exploration of American roots music and the wild ways he has turned it inside out with the White Stripes, the Raconteurs, the Dead Weather, and now as a solo artist. That advice just as easily worked as a mantra for this iconic music festival that has begun to feel more like a state of mind than an annual event. Staying true to producer Jay Sweet’s vision to appeal to the musical omnivore, the 55th edition of the Newport Folk Festival, which took over Fort Adams State Park from Friday to Sunday, was all over the map. That, of course, is exactly how most young people experience music these days. This year’s installment sold out before the lineup was even announced, drawing 10,000 fans each day. By the numbers, that computed to nearly 25 hours of music over three days, with more than 50 acts on four stages and some pop-up ones around the fort, plus after-parties that kept the good times rolling well into the night. With some exceptions — notably the hair-parting force of the Oh Hellos — the lineup veered away from supergroups bounding with exuberance, a trend that had been prevalent in recent years. In its place was a focus on intimacy and the power of a singular voice. Formerly of Old Crow Medicine Show, Willie Watson summoned the fire and brimstone of an old-time preacher with a moving set that drew on country blues and gospel. From Texas, Shakey Graves conjured a wall of sound with just a drummer and his guitar, picking circular patterns tinged with minor chords. The Milk Carton Kids, stepping onto a bare stage in suits and carrying their acoustic guitars along with an old doctor’s bag, were pin-drop quiet but supple as their harmonies and guitars entwined. Shovels & Rope, a husband-and-wife duo from South Carolina, locked eyes as they tore through a hell-raising set of power chords and tender pleas. Their chemistry was so intrinsic that you felt like you were watching them in their living room. Even Deer Tick, the Providence boys known for their rough and rowdy ways, struck an unexpectedly heartfelt note, even if they were dressed in white suits that made them look like a wedding band straight out of 1984. They’re growing older and the maturity suits them, which was especially apparent when frontman John McCauley’s pregnant wife, fellow musician Vanessa Carlton, joined them for a duet. And then there were the acts who had no direct parallels on the roster, from Trampled by Turtles’ breakneck bluegrass freakouts to the spiraling guitar histrionics of the Mexican duo Rodrigo y Gabriela. Benjamin Booker, a blood-and-guts rocker from Florida flanked by a drummer and bassist, coaxed squalls of feedback and thunderous chords from his electric guitar. When he dropped to his knees in front of his foot pedals, he inadvertently recalled a legendary image from another music festival: Jimi Hendrix setting his guitar ablaze at Monterey Pop in 1967. Sun Kil Moon found beauty in life’s insignificant details in deeply personal songs shot through with Mark Kozelek’s spectral vocals. (I don’t think I’ve ever heard so much reverb at Newport Folk Festival.) From New York by way of Tennessee, Valerie June played a mean banjo and emoted like a sage old mountain balladeer singing on her front porch. June’s songs are rooted in Appalachia, but with soulful hints of urban sophistication and a voice whose twang pierced the ear. Pokey LaFarge’s old-timey songs traveled the back roads of America, “living life one town at a time.” Hozier, an Irish singer of soft stature but booming voice, added a touch of R&B seduction to Sunday’s lineup, including a stunning collaboration with the Berklee Gospel and Roots Choir. And setting up shop on the enclosed Museum Stage, Third Man Records’ Language Lessons showcased writers giving impassioned poetry readings. Jimmy Cliff, the Jamaican reggae icon, was an ambassador of Newport’s commitment to social justice, at one point leading the audience in a singalong of “We’ve got to stop the war,” from an updated version of his classic protest song “Vietnam.” There was also pure joy in listening to his signature tunes — “Many Rivers to Cross,” “You Can Get It If You Really Want” — ripple over a dancing crowd basking in sunlight. This year was also heavy on new groups spinning gold from the past. The Haden Triplets, made up of sisters Petra, Rachel, and Tanya (daughters of the late jazz bassist Charlie Haden), had a down-home charm as they lovingly interpreted songs by the Carter Family and the Everly Brothers. As Friday’s headliner, Ryan Adams previewed his forthcoming album with a nervous energy and spastic banter that sometimes obscured the finer points of his set. When he was on point (“Oh My Sweet Carolina,” “Come Pick Me Up”), he was indeed a heartbreaker. Earlier in the day, Jenny Lewis was in full splendor with bright, pastoral songs that matched the rainbow motif of her stage attire and set design. Meanwhile, White gave the weekend an air of rock-star intrigue, turning heads as he roamed the grounds with a small entourage. He popped up side stage several times, and upon leaving Booker’s set, he spotted a baby asleep in a stroller. He whipped out a Polaroid camera, took a quick photo, and then gently placed it inside the stroller. His headlining performance was all about him, though, a warped tour of his various projects as captured in guttural, extended jams and black-and-white footage shown on the jumbo screen. Mavis Staples, who turned 75 earlier this month but was still celebrating over the weekend, was the glue that held it all together. The gospel-soul dynamo even joined the Boston-bred Lake Street Dive to sing on “Bad Self Portraits,” the title track of their recent breakthrough album, swapping grunts and groans with lead singer Rachael Price. As Sunday’s closing act, Staples took the crowd down the aisle and into the pew. Church was in session, and Staples roared as if an imaginary pulpit trailed her. She welcomed several guests, including Jeff Tweedy, the Wilco frontman who had just performed an introspective solo set on the same stage and who produced Staples’s last two albums. For “The Weight,” Norah Jones and Taylor Goldsmith from Dawes chimed in, visibly humbled by the legend to their right. A nearly 12-minute version of “I’ll Take You There,” the 1972 Staples Singers classic, gave way to a poignant closer. In honor of Pete Seeger, who died in January, Staples led a good chunk of Sunday’s lineup in a finale of “We Shall Overcome.” Arms draped around one another, the torch indeed had been passed.